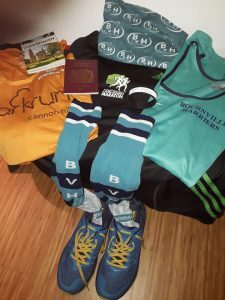 Steve Doswell reports: “As a few BvH folk know, I’m attempting a charity challenge to run in all 28 countries of the European Union before Britain leaves the EU at 11pm on 29 March 2019. Even if there’s a delay, I’m still sticking to my own deadline. By last November, I’d run in nine countries and had some catching up to do. So when I read that the parkrun teams in Copenhagen and Malmö were joining forces for New Year’s Day, I knew I had to go there and run the double – two EU countries in one morning? Couldn’t miss that! Especially as it would mean crossing the famous Øresund bridge that links Denmark and Sweden (‘The Bridge’ of TV Scandi-noir fame). When I pitched to my wife Liz that we spend NYE in Copenhagen, without missing a beat she said: “I assume there’s some running involved…?! (she knows me too well!). But like me she’s a fan of ‘The Bridge’ so she was enthusiastic, too. After sampling NYE Copenhagen-style (when traditionally mild-mannered Danes like to free their inner Viking and bring an unexpected dash of mayhem to the city streets, letting off fireworks everywhere and anywhere in a haze of Tuborg), at 8am on NYD I trotted out towards the wooded suburban scrubland at Amager Fælled for the first of the morning’s two parkruns, sidestepping small knots of worse-for-wear revellers still returning home from NYE. I’d prepared for everything I imagined I’d need. Not only #DFYB (I’d been wearing my barcode wristband for two days) but also #DFYP – without my passport I’d be turned back by Swedish frontier police on the other side of the bridge, sorry, I mean…’The Bridge’! Arriving at parkrun early for once, I found myself among 80-odd Brits (plus a pair of Poles and an Australian couple) who’d made the trip to run the Scandi NYD double. There were plenty of cow cowls to be seen around the necks of seasoned parkrun tourists, while many of us had chosen to show off our running club or home parkrun colours, in my case a double-mix of Cannon Hill and BvH apparel and accessories in a multi-layered bid to fend off a penetrating wind. Although it was unseasonally mild for a Scandinavian winter, the windspeed was a startlingly strong gale force 50mph. It made walking difficult, running even more so, as we discovered here in Copenhagen and more so still later in Malmö. Run director Anne Petersen and her team of volunteers were ready and prepared for us, even though they’d had to scale up their expectations about how many people would be attracted to Copenhagen for this unique cross-border double parkrun. Amager Fælled began in 2009 and was the first parkrun to be set up outside the UK. The two-lap course was flat, mostly run on tarmac paths and easy apart from a couple of times when I was broadsided by the fierce gusty gale. On NYD we set a new participation record with 160 runners (previous: 146). Stage 1 completed, it was now time for the adventure to continue. As each finisher was scanned, we headed off to the nearby metro station and a couple of stops later, found ourselves part of a large parkrun travelling community on an otherwise deserted station waiting for the 10.13 train to Sweden. 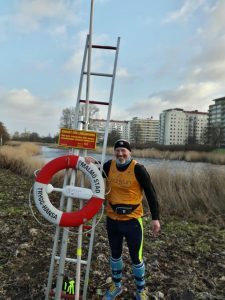 By arrangement, The Malmö Ribersborg parkrun team had fixed their start time for 11am. It was only a 25-minute journey over to Malmö but with passport checks and a short bus ride at the other end, it was going to be tight. And indeed by the time we’d crossed the bridge (sorry, The Bridge!) into Sweden and reached Malmö Central, we had just four minutes before the bus was due to leave, which was why the regular station users found themselves observing a stream of runners jogging across the concourse. Happily, the bus waited for us, thanks to parkrun RD Anders who had come into town to meet us. Seven minutes later we were at Ribersborg and had joined the locals and others who had already driven over the bridge (yes, The Bridge!) and who we found cowering against the side of a small building for shelter against the wind which at this seaside spot was by now ferocious. There was laughter as RD Katherine told the crowd ‘Last week we had 13 people. I think there’s a few more here this morning!’ Indeed there were: the unique pulling power of a double country, double parkrun challenge had now almost doubled Ribersborg’s previous record of 79, as 152 runners braved the full frontal assault of a vicious sea gale. And when it was finally over, we had one more challenge to face, to pass a dune being swept up into 50mph sheets of sand blasting the runners as they struggled over a low 200-metre wooden causeway just above the whipped-up sea’s surface to enjoy coffee and cakes in a warm, inviting café. We’d done it! 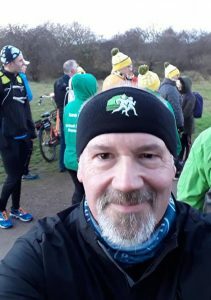 This entry was posted in Parkrun, Race Reports by BvH Admin. Bookmark the permalink. Well done Steve – that sounds amazing. I am so envious, but we always stay at home for NYE and I do a local(ish) double. Good luck on the rest of your adventures with your EU passport!